Preheat oven to 325ºF (160ºC), with the fan switched on, (350ºF/180ºC if you don’t have the fan on). Butter and line a 9 inch cake pan with parchment paper. In a medium bowl sift the flour and baking powder, set aside. In a large bowl combine your butter, salt, and sugar; mix with an electric hand mixer on high speed until the mixture is pale and fluffy (about 5 minutes). Once your butter mixture is fluffy, add in your eggs one at a time, beating for about 1 minute on high speed after each addition (your batter will start to separate a bit, this is normal). After incorporating the eggs, add in half of the flour and fold with a spatula until completely combined, then add in the remaining flour and do the same. Spread your batter inside of your prepared cake pan with a small offset spatula, try to get it as even as possible. Bake for 30-35 minutes or until the cake springs bake when pressed and skewer comes out clean. Allow for your cake to cool in the pan for 10 minutes, then remove it and wrap it in clingfilm while it’s warm (this will really help seal in the moisture). Allow for your cake to cool completely before continuing to the next step. In a large bowl, combine the whipping cream, powdered sugar, and vanilla; with an electric hand mixer whisk until stiff peaks form (start on a slower speed, then increase as the mixture thickens, so you don’t splash yourself with cream). With a serrated knife, divide your cake in half, so you have two layers. Soak the cake with some milk, enough to moisten it without drenching it (with a spoon or pastry brush). 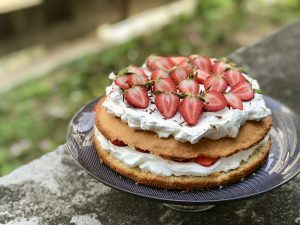 Spread about half of the cream on the bottom layer (you can also pipe it if you like), layer on half of the strawberries, then place the top layer of the cake on top of that. Soak it with some milk, spread on the remaining whipped cream and strawberries. You can decorate with nuts, chocolate or even edible flowers. Allow the cake to set in the fridge for at least 1 hour before slicing. This cake slices into 10 regular pieces. You can store it covered for up to 3 days in the fridge.